If you’re in the market for washered hinges, you’ve come to the right place. Ironmongery Experts delivers only the highest-quality hinges from our range of masterfully-crafted construction and joinery products. Complete with phosphor bronze washers, a washered hinge is a little more specialised than ball race hinges and, contrary to more lightweight designs like light duty hinges and the kitchen-oriented cabinet hinges, buying washered hinges ensures optimal operation when installed on heavier doors, much like our selection of broad butts for an assortment of residential applications. If you need a door that’s more resistant to thievery, spring hinges are the way to go. We also stock an impressive range of niche fixtures like piano hinges for piano covers, low friction components such as our thrust bearing hinges, and even hinges that can assist with the clearing of an object such as piping when the door opens; parliament hinges are perfect for scenarios like these, and we have a dedicated selection for many set ups and formats. 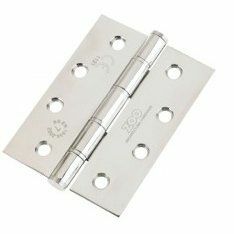 If you need a hinge that distributes the weight of the door over a larger area, our tee hinges will meet your needs. For cast iron gates and similar applications, heavy reversible hinges will do the job just fine. And if you need something a little more resistant to erosion, our galvanised hook & band hinges provide excellent protection against the elements year-round. Every type of hinge is available in a wide variety of sizes and metal finishes, and new products are being added all the time. If you’d like to make an order by phone, get in touch with us via our contact page.